Join the DPCNA & Become a Member! In the 16th century the breed originated from the Spioenen (also called Spanjoelen) which came via France from Spain. In the Netherlands they were called Partridge dogs. 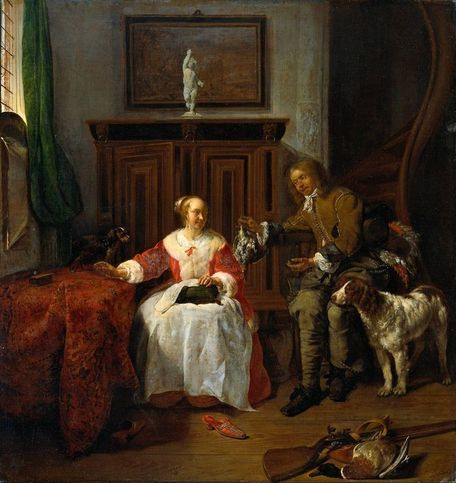 In the eastern part of the country, especially in the province Drenthe, these dogs were kept purebred and were not mixed with foreign breeds as done elsewhere. The rural Province of Drenthe was unusual, in that it allowed "even" the common gentry the right to hunt. Thus, the local mayor, the farmer, and the "landed" population in general needed a dog to support their pursuit of various small game. For over 300 years, the Drent was that dog. Unlike many other hunting breeds, which were developed by, and for, the "upper crust" only to hunt, the Drent was expected to hunt all game, (and even varmints), and also pull duty as watch dog, child playmate, etc. Some were even used to pull the dog-carts of the day. On the 15th of May 1943 the breed was officially recognized by the Raad van Beheer op Kynologisch Gebied in Nederland. This was strongly promoted by Baroness Van Hardenbroek, Mr. Van Heek Jr. and Mr. Quartero. The breed is related to the Small Münsterländer and the Epagneul Français. The 5th of June 1948 the Dutch breed club was founded, the Vereniging “De Drentsche Patrijshond”. The Dutch Drent breed club has founded the Drent breed on three "pillars": hunting, pet qualities, and watch dog. During the breed's long history, the Drent had to pull "triple duty". Not only was the dog expected to help put meat in the pot, it was expected to warn of visitors to the farm or estate, and to be a pet "par excellence" for the family. This is what makes the Drent such an ideal hunting dog for us in the US. Not only are they intelligent enough to be useful in hunting a variety of game, they are also marvelous additions to the family. The Drent is a true versatile hunting dog. For the sportsman who wants to hunt leisurely without too much physical effort in the varying fields, this is the ideal dog. The dog hunts within range of the gun and searches the game without going too far away from the hunter. Keeping in touch with the hunter seems necessary for him. When approaching the game he points as firm as a rock and impeccably at a moderate distance. When pointing, the dog is waiting for the hunter to come near; when this takes a long time, he will look back for his master. Since his North American introduction, the Drent has proven to be an excellent choice for us. 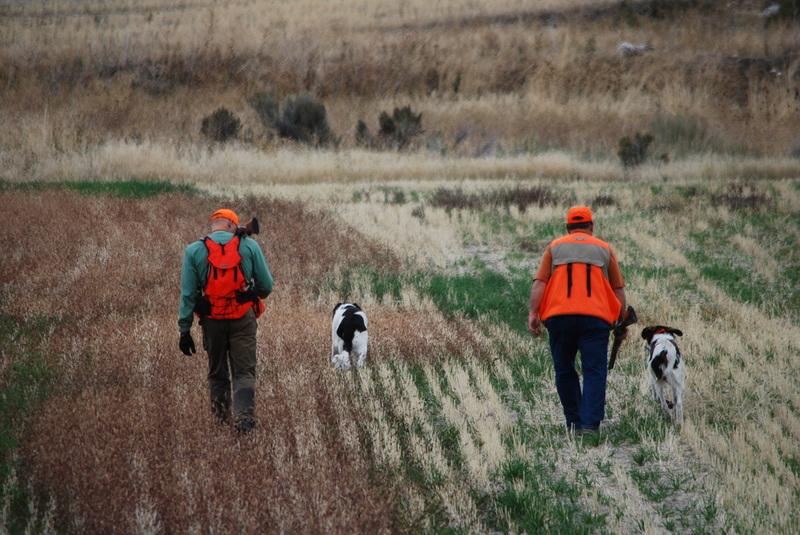 Even though a day of hunting may include birds as varied as sage grouse and chukars, and terrain as varied as high desert sage brush and aspen thickets, the dogs are capable of switching gears as fast as needed. Best of all, they enjoy it all. 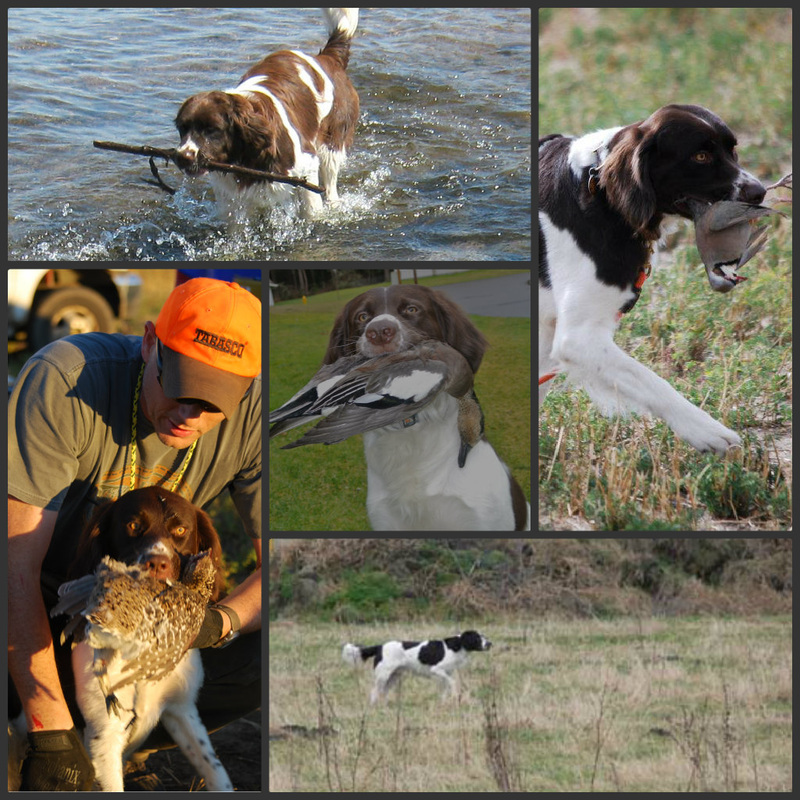 He has the adaptability needed to hunt all manner of upland game and waterfowl. After the shot, he retrieves from land and water and has a reputation as a determined and efficient finder of lost game. These characteristics are innate, therefore he needs little training. Because of his gentle character, it is wrong to train him with force. 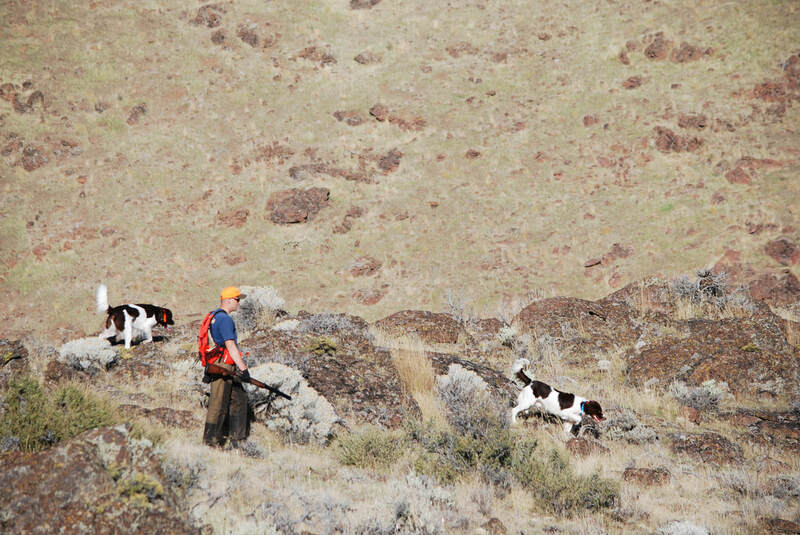 In the photos (starting lower left and moving clockwise): Jorja with sharptail grouse, Teddy enjoying a good swim, Booker retrieves a chukar, Barak points with style. Center: Fowler showing off his widgeon. Brian (L) and Jim M. (R) enjoy a day in the field!